The Wellwood Centre in Ireland sits in eight acres of beautifully landscaped grounds. Their dome provides a relaxing space and central focus point for their clients. Pat & Mary Gaynor are both garden enthusiasts and lovers of all things outdoors. In 1999 they purchased some land in County Carlow in Ireland with the view to one day opening their own wellness centre. Today that dream has been realised with their Wellwood Centre which provides a range of relaxation treatments in a secluded haven near Bagenalstown. Key to their vision of creating a purpose built centre was to provide a warm and hospitable experience. Landscaping was central to achieving this and includes four acres of trees and hundreds of plants and shrubs. The addition of a glass geodesic dome adds a wow factor to the site, and its glass construction helps it blend into the natural environment. It was the geodesic design; we loved the look of it and how it would complement what we wanted to achieve. We’re absolutely delighted. It was a landscape architect that had the vision to incorporate a dome and originally proposed the idea. The Gaynor’s loved the design and quickly realised the potential benefits a dome would bring. They saw the dome as an elegant yet practical design that would create a feature they knew would make their new centre stand out. The Gaynor’s wanted to be sure their investment in time and money was going to be worthwhile and therefore high quality and longevity of the dome were key factors. They also wanted to build the dome themselves, and so the high build quality had to be achieved with a self-build structure. It was its design, strength, and that it was self-assembly which made it the obvious choice for us. The SOLARDOME® Sanctuary gave them the space they needed, and as with all the Solardome glasshouse range of domes, it is built using mill finished aluminium and 4mm toughened glass to give a strong and long lasting structure. It was grand; we got it built in just two days. 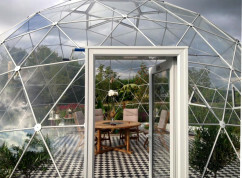 Solardome gave us a very good personal service supporting us throughout the build. With a 48m2 base, the SOLARDOME® Sanctuary can easily accommodate around 40 people. The Wellwood Centre has chosen to use some of this space for a relaxing water feature surrounded by beautiful planting to create the tranquil setting they desired for their clients. This will allow them to unwind after their treatments, and add to their experience at the centre. I love it; my clients love it. Everyone is really impressed by the warm, light and airy space we have in the dome. The challenge To create a relaxation space in a health and wellbeing centre. 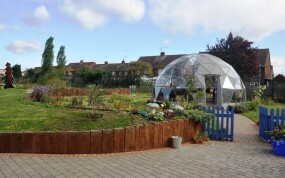 A SOLARDOME® Retreat is at the hub of the new OASIS community gardens project on the Kilton Estate in Worksop, Nottinghamshire.